Room for singles, couples, families and groups – all under one roof! Enjoy homemade, country-style breakfast prepared every morning. Centrally located in Highmore, SD, the Hydeout is easy to find – just a block north of the Hyde County Courthouse. Built in 1909, the charming building which holds the Hydeout Bed and Breakfast is full of its own hometown charm and history. In fact, Beth and John are only the fifth owners of the house – it’s the kind of place that people love too much to leave, and we know you’ll love it, too! This cozy room instantly reminded us of Beth’s mother, Mary – which just happened to be the name on the door to the room when we first saw it. With a full-size bed, this room will sleep two comfortably. 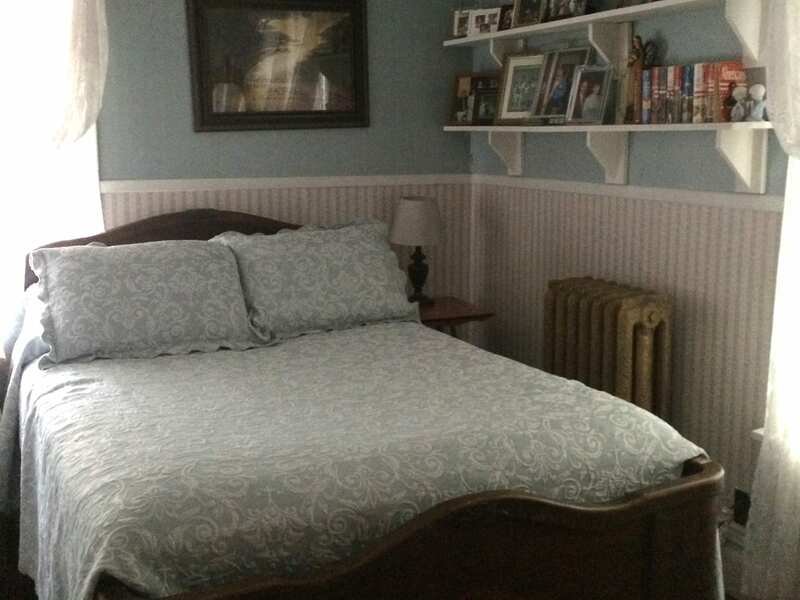 This spacious room with a queen-size bed was named for John’s mother, Shirley. (No, her name wasn’t on the door when we first got here, but we decided to go with the theme.) This room will give two adults plenty of room to spread out for a quiet night. Beth’s Grandma Helen gets the honors of this bedroom, which has its own in-room vanity sink. 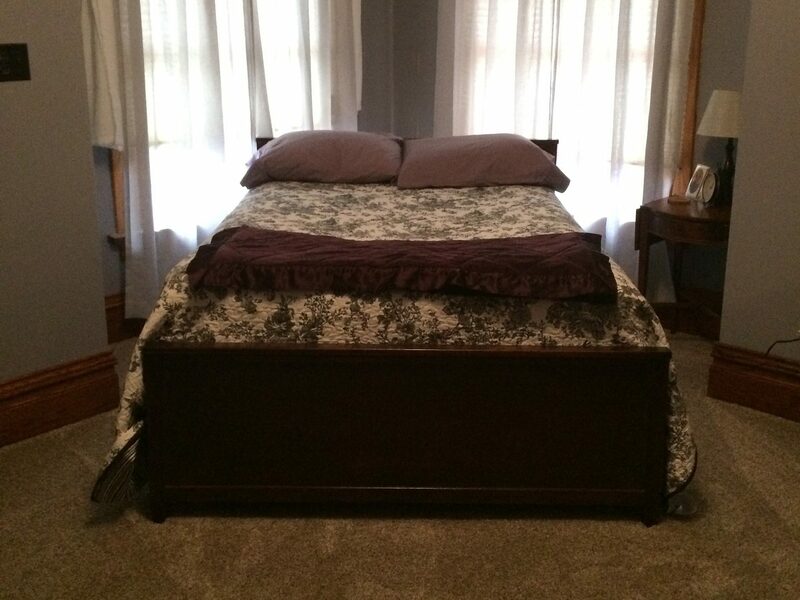 If you’re looking for a room where you can feel like you’re truly being taken care of, snuggling down in Helen’s antique bedroom set is the way to go. Our largest room has both a queen size bed and a day bed – perfect if you’re a couple traveling with a child. Named for John’s Grandma, Iva, we’re pretty sure she’d be thrilled to have you and your loved ones tucking in for a good night’s sleep, here. 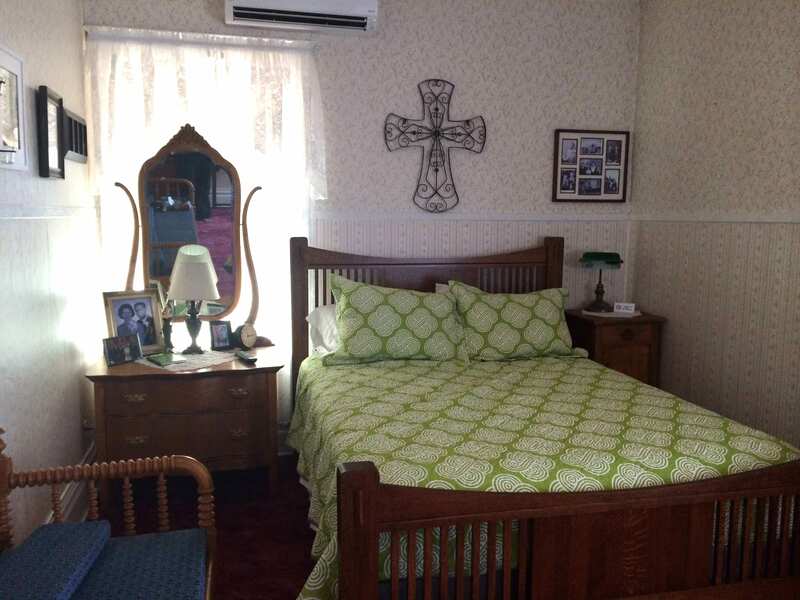 Papa’s place has room for a larger group–it can sleep up to 5 on beds, with room for more. It has all the comforts of home, including its own kitchen and a private bathroom with laundry, without the hassle of clean-up. 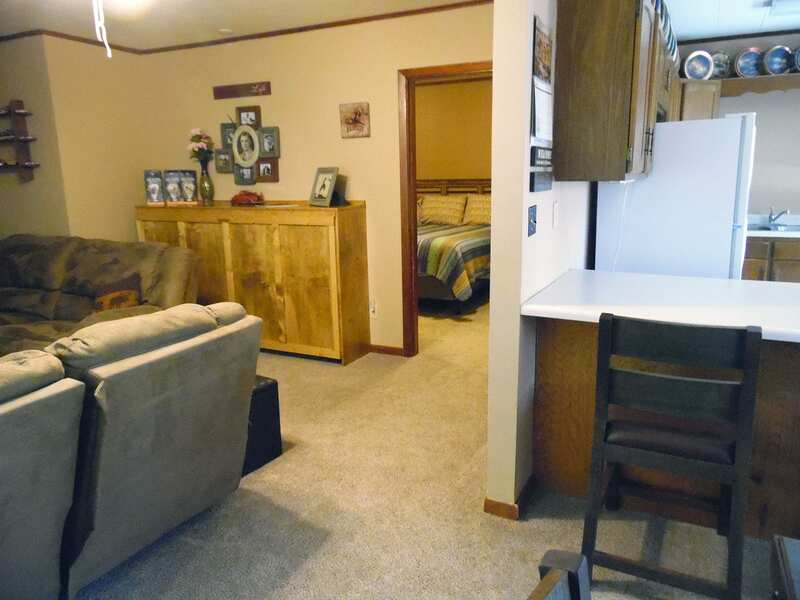 And, if you need a little extra space to get social, Papa’s place is adjacent to John’s Man Cave. 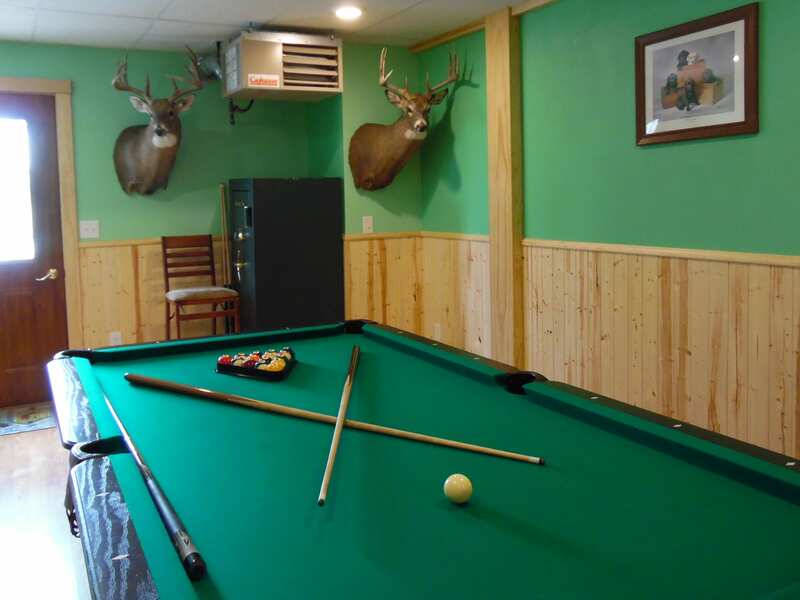 Relax after a long day of hunting or other adventures in the Highmore area by playing a game of pool in the Man Cave. Absolutely loved my stay in Hydeout B&B! Beautiful rooms, delicious breakfast with baked goods, it was truly a delight to stay there. I only wish it could have been for more than the 4 nights. The location was a great mid-point for the many cities that I went to in search of my roots. John and Beth were great! Looking forward to going again! Thanks! 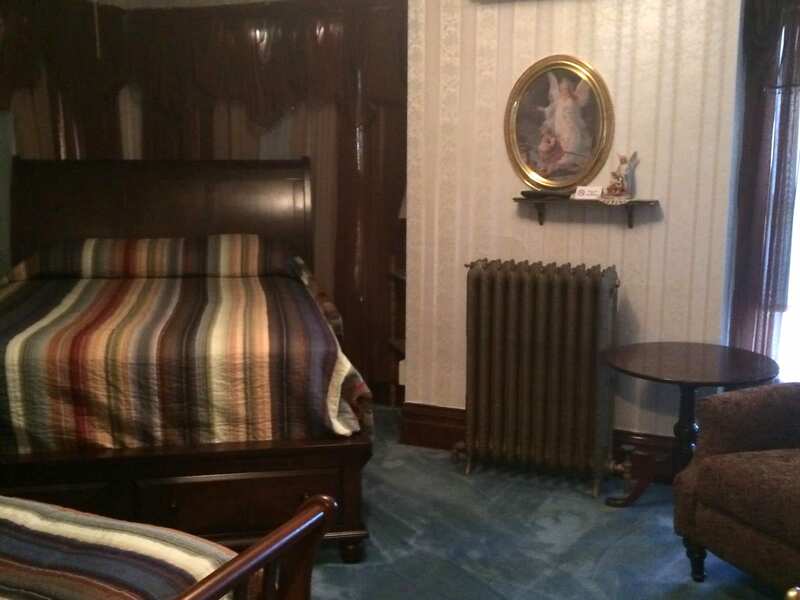 This is a cozy bed and breakfast that is both historical and easily comfortable. The rate really isn’t bad for a small town and during events like old settlers day and sturgis, this place sees a variety of visitors. The hydeout is very clean and upkept; and they start your morning off right. They are also nearby highmores hotspots which makes visiting stores, bars, and other restaurants safe and easy, so you can have that night out in confidence. I haven’t had any complaints and neither did my friends who i recommended the stay. This place is amazing, great food, clean rooms, awesome atmosphere…do yourself a favor and give it a try. My wife and I were lucky to find this bed and breakfast on the way back from the Black Hills. John and Beth were fantastic hosts. We showed up late (forgot about the time zone change) but they didn’t mind at all. The room was comfortable and quiet. The house was very nice and had a lot of history. It was great to relax and catch a bit of cable before hitting the sack. In the morning, breakfast was delicious and they let us hang out for a little bit and check work email. I would love to stay here again on our way to/from another Black Hills adventure. I definitely recommend it for couples, a group of hunters, or motorcyclists (like us). Thanks John and Beth! During our roadtrip to the badlands we found a great stopover in lovely highmore,and your wonderful house.Especially memorable was the evening with you and John on your porch.And after an excellent breakfast and some valuable informations from Beth, we continued our trip.The midwest was great but the badlands in SD were absolutely gorgeous and unforgettable. Highmore is a small, rural town, and the county seat of Hyde County. Centrally located just 48 miles East of Pierre, the state capital, Highmore is principally a ranching, farming, agricultural community. This central South Dakota area is also the gateway to Big Bend on the Missouri River and offers many fishing, hunting, camping and other recreational, economic development, and business opportunities. Highmore is in the middle of both Hyde County and the state of South Dakota intersecting US Hwy 14 and SD Hwy 47, with proximity to highway, railroad, and air transportation. Highmore and Hyde County are also located in one of the best and largest wind energy development areas in South Dakota. Find Your Great Place in South Dakota and inspiration for your next vacation. Check out our social channels for the monumental parks, hidden gems and amazing attractions throughout the state! Hyde County created in 1872 and organized April 12, 1883 by the Dakota Territorial Legislature. The county was named after James Hyde, a member of the Territorial Legislature. The current courthouse was constructed in 1911 at a cost of $51,941.00. The Hyde County Jail was discontinued in 1974 and jail services were contracted with surrounding counties. During a drought in 1976, a jobs program paid for local citizens to beautify the courthouse interior. Visitors can find original furniture, converted oil light fixtures, original vaults and blueprints, marble countertops and original woodwork inside the building. The “Courthouse Gang” has put on an annual Christmas tree display since 1994 where businesses, individuals, and organizations decorate trees to be shown throughout the Christmas season and during an open house. Ever thought of being a farmer or a rancher? Now is your chance! Inquire at the front desk about our full- and half-day excursions. The South Dakota Game, Fish and Parks provides sustainable outdoor recreational opportunities through responsible management of our state’s parks, fisheries and wildlife by fostering partnerships, cultivating stewardship and safely connecting people with the outdoors. Take a scenic drive along the Laura Ingalls Wilder Historic Highway. Depending on the time of year, we do book up fast! Call 605-852-2540 to see what rooms are available. We would love to welcome you to Highmore! Enjoy a delicious breakfast every morning!